Heavy-duty machinery is digging up and levelling the red and yellow soil of the Cumberland Plain between The Northern Road and Elizabeth Drive. Articulated trucks piled high with dirt thunder along Badgerys Creek Road in both directions. On Sydney’s southwestern frontier, I can feel the earth rumbling under my feet. They’re building an airport out here. On the approach to a small concrete bridge a faded sign reads South Creek Catchment Area. Might this be a bridge over the famous Badgerys Creek? I peer over the railings. The creek bed is dry and choked with bulrushes — it’s midsummer, so no surprises there. Yet it’s hoped that the South Creek catchment will provide a “green spine” for a new city being planned for these parched parts. Where will the water come from to fill the creek to cool the people who will live in the Western Parkland City? Across the road from the bridge, another sign, much bigger and bolder, reels off numbers with which I’ll soon become very familiar — 28,000 jobs by 2031, ten million passengers by 2031. The airport-with-benefits billboard. A few hundred metres along the road, just past Tony’s Duck Farm, a local estate agent has put up a placard advertising land for lease: Site 5000 sq. m. House and Yard. Centre of Aerotropolis. The placard shows a plane taking off, but falls short of explaining what an aerotropolis is. There’s probably no need out here. After six decades of political bickering and dithering over whether and where to build a second airport for Sydney, it’s all systems go. People who own land surrounding the 1780-hectare site of the Badgerys Creek airport (properly called Western Sydney International (Nancy-Bird Walton) Airport, after the pioneer aviator) know they’re sitting on a goldmine. That’s what an aerotropolis means out here: money. Pan out, though, and the concept is more controversial. Put simply, an aerotropolis is an airport city — as opposed to a city airport. Traditionally, airports have served their cities but not been part of them. In most cases (Sydney’s existing Kingsford Smith Airport is an exception) they’re located on the empty or sparsely populated periphery of existing cities, and the idea is to get in and out of them, and away, without dallying. They’re noisy and polluting. From the early days of civil aviation, certain urban planners (among them Le Corbusier) and airport designers thought that cities should and would grow around airports. People and businesses, they argued, have always clustered around transport hubs, whether they’re ports, railways or highways. But the airport city didn’t get lift-off until the early 1990s when a professor of business at the University of North Carolina, John Kasarda, revisited the old airport city dream, tweaked it to suit the emerging global economy and came up with the aerotropolis model. It’s his brand. Briefly, this is the idea. Thirty-five per cent of the value of global trade is freighted by air. Locating offices and warehouses and other essential infrastructure near airports gives companies faster access to their customers and suppliers. It could be that they are shifting heirloom tomatoes or sushi-grade tuna or circuit boards around the world, but equally their cargo could be corporate executives, investors or marketing bigwigs. The higher the value of the goods and services involved, the bigger the gains, according to Kasarda. In other words, time is money. Kasarda’s aerotropolis model has considerable reach. The Chinese are mad for it. Zhengzhou Airport Economy Zone has been developing on aerotropolis principles since 2010 and has spawned dozens of similar projects across China. Hong Kong University geographer Max Hirsh, author of Airport Urbanism, says that when it comes to designing airports, the “aerotropolis” is “one of the most influential development models out there.” Other places usually cited as exemplary aerotropolis developments are Zuidas, near Schiphol Airport in the Netherlands, and Songdo International Business District near Incheon Airport in South Korea. But get used to seeing this word, ungainly though it is, for all the indications are that Kasarda’s model has carried the day in Western Sydney. It might be a cliché, but the prospect of a new twenty-four-hour international airport, scheduled to open in 2026, really is a game-changer for the region. It’s the first major metropolitan airport to be built in Australia for fifty years and it’s caught the attention of political and business leaders in a way that nothing else in this region has for decades. 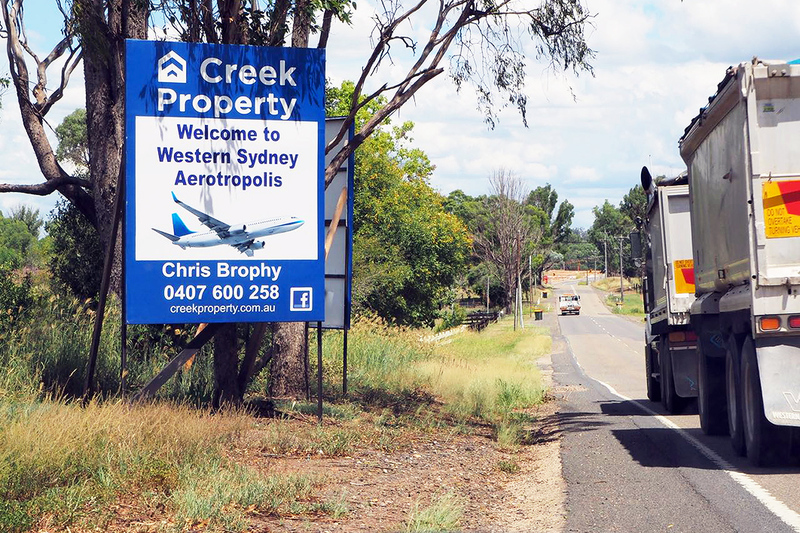 Since 2014, when the federal government approved the Badgerys Creek site, the notion of the aerotropolis has been woven tightly into planning not just an airport, but greater Sydney itself. 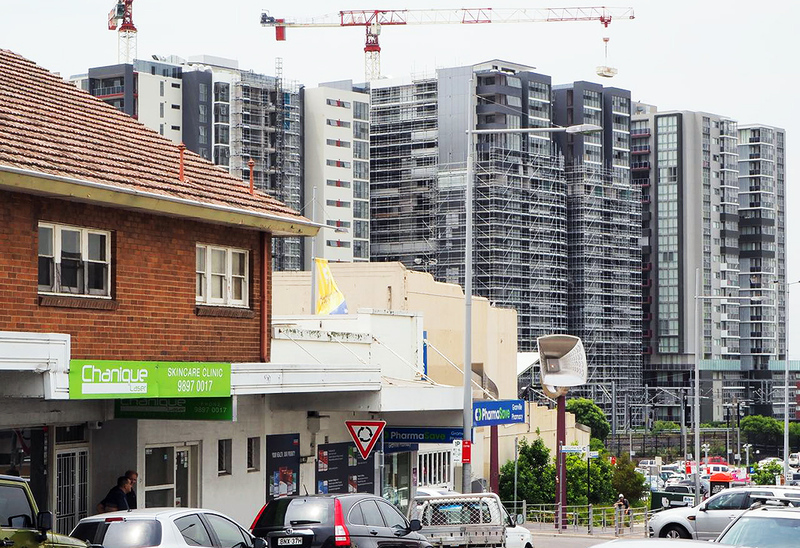 From a standing start five years ago, it’s become an important driver of a political narrative of “rebalancing” the economic and social opportunities of the greater metropolis so that more of them fall Western Sydney’s way. From the moment the operators of Sydney’s Kingsford Smith Airport let it be known that they would not take up their option to build and operate the new airport (too risky, they judged), it was clear that this project was not just a state matter. Malcolm Turnbull’s government stepped quickly into the breach and announced it would build the airport at arm’s length. In May 2017 it allocated $5.3 billion off-budget and set up a fully owned government corporation called WSA Co to get the job done. And then, only four months later, two “visions” for the future of Western Sydney were released in short succession — the Western Sydney City Deal (a collaboration between the federal and NSW governments and eight Western Sydney councils) and the Greater Sydney Commission’s A Metropolis of Three Cities. These documents, the latter an intensive and large-scale piece of planning, allocated Western Sydney a new place in the metropolis envisaged for 2056, a city of eight million people with half of them living west of Parramatta. In a leap of faith, the commission’s three-cities vision gives this frontier city equal status with the established Eastern Harbour City (with Sydney’s CBD at its core) and the emerging Central River City. Or, if you want to look at it another way, it brings Greater Western Sydney, with its long history of neglect, into the metropolitan fold. The plans acknowledge the untapped economic potential of a region with one of the highest population growth rates in the developed world. Carved off, it would be Australia’s fourth-largest city. But there’s a subtext to this planning bonanza that is never expressed in so many words. It’s a belated recognition of the significance of nearly two million people who live in the “middle of nowhere,” people who have long been regarded as fringe dwellers by those who live in the charmed ring of suburbs around the old city centre — that is, if they have thought about them at all. I once worked for an editor of a national magazine who said he wasn’t interested in anything west of the Gladesville Bridge, seven kilometres from Sydney Town Hall. Seriously. 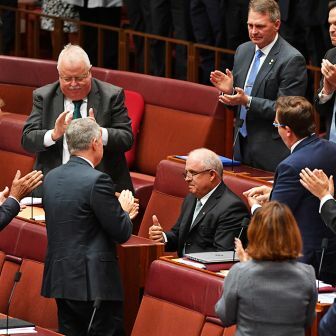 You wouldn’t broadcast that kind of attitude today, given that so many people in high places think that this is Western Sydney’s time, but it still informs the “culture of governance,” according to UNSW urban policy professor Sue Holliday. She should know. She’s a former director-general of NSW planning. It’s a commonplace that you can tell which way the political wind is blowing by putting up your finger in Sydney’s western suburbs, that elections are won or lost in that vast urban sprawl where the city is growing fastest and needs are hardest to meet. 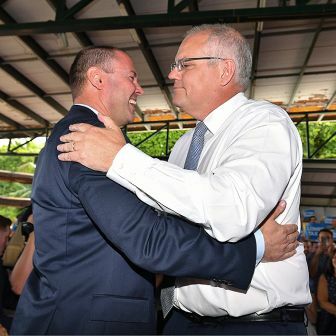 Both state and federal elections are looming here (23 March in New South Wales and within three months nationally), and we would normally expect much hyperventilating around all things western, until the shouting fades after votes are cast. This time round, though, the campaigning is not so much around piecemeal electoral handouts. The state and federal governments have jointly committed billions of dollars to building a road network to support the airport and the emerging suburbs of the Western Parkland City. They’ve also promised the first stage of a metro-style north–south rail link connecting travellers from the airport and the aerotropolis to St Marys, twenty kilometres north by car, and the rest of Sydney’s rail system. These are grand projects with long timelines and they’re woven into planning for the airport, the aerotropolis and the Western Parkland City via the City Deal. 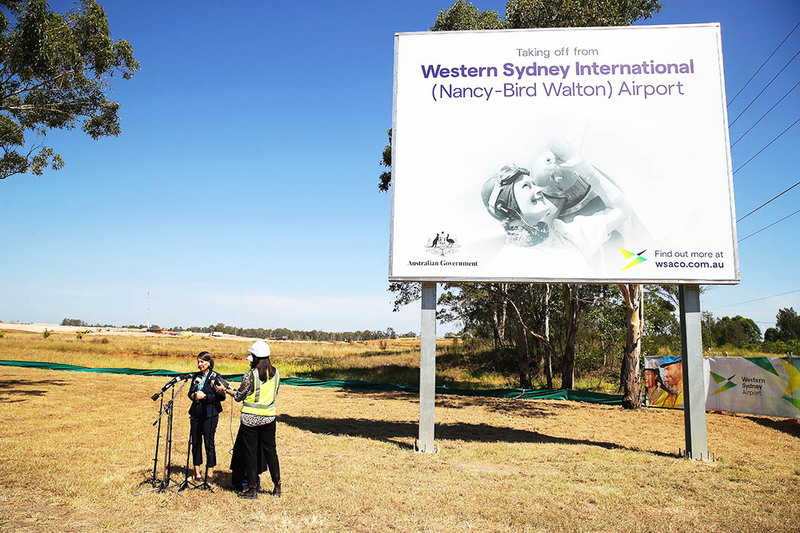 Western Sydney Airport and the City Deal broadly have bipartisan support. Two years ago federal Labor give a glimmer of hope to those who adamantly oppose a new twenty-four-hour airport by promising to minimise the impact of aircraft noise and raising the prospect of a no-fly zone over communities between 11pm and 6am. But that was before the aerotropolis came to town. Labor policy now proposes replacing the City Deal with City Partnerships, but there’s no suggestion of the deal’s commitments being shelved. It’s a rebadging exercise, in other words, though Labor has traditionally had a stronger commitment to cities than the Coalition. “I would have thought both sides of politics at the federal level would be reasonably attracted by this type of approach because it allows them to spend money when they want to spend money,” says the Grattan Institute’s transport and city analyst Marion Terrill. 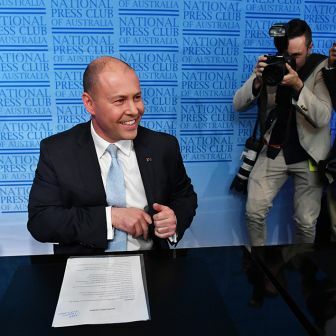 The Western Sydney City Deal, signed in early March last year by Malcolm Turnbull alongside NSW premier Gladys Berejiklian and eight Western Sydney mayors, is not a binding commitment. 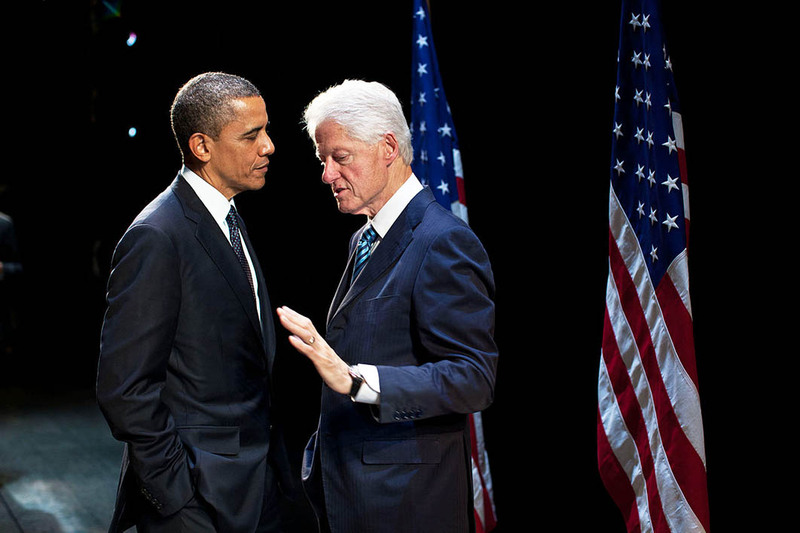 But it does represent a relatively new degree of collaboration between the three tiers of government. It’s primarily a mechanism for investing in long-term transport and job-creation projects across a semirural region that captures existing townships in Greater Western Sydney — from Campbelltown in the southwest across to Liverpool and up north to Penrith. This is where the people are heading, with planners foreseeing 500,000 new residents by 2041 in just two areas: the South West Growth Area (between Badgerys Creek and Liverpool) and the North West Growth Area (north of Penrith). The Western Sydney City Deal is also an extremely close match with the Western City District component of the Greater Sydney Commission’s three-cities “vision” and was pulled together in the same time frame, between 2016 and 2018. The GSC, the city-wide planning authority, came into being in January 2016 and soon floated the concept of “rebalancing” the city. The final draft of its three-cities vision was released just a couple of weeks after the Western Sydney City Deal was signed. It shares many of the same aspirations as the City Deal for Western Sydney, including the Western Parkland City and “the 30-minute city,” the latter being shorthand for cities that are engineered so that home, work and play are all accessible within thirty minutes — an ideal that is laughably far from the reality for many Western Sydney residents now. The GSC plan was released concurrently with Future Transport 2056 and the State Infrastructure Strategy 2018–2038. “Having three cities, each with supporting metropolitan and strategic centres, will put workers closer to knowledge-intensive jobs, city-scale infrastructure and services, entertainment and cultural facilities,” the visionaries announced. The chief commissioner of the GSC is Lucy Turnbull, a former mayor of Sydney and chair of the Committee for Sydney during 2012–15. “Malcolm Turnbull would not have thought about Western Sydney without Lucy,” says Holliday. Ian Watson, a veteran labour market analyst attached to the Social Policy Research Centre at UNSW, is sceptical on other grounds: scratch the surface of all these proposals, he says, and you’ll find pressure for property development. 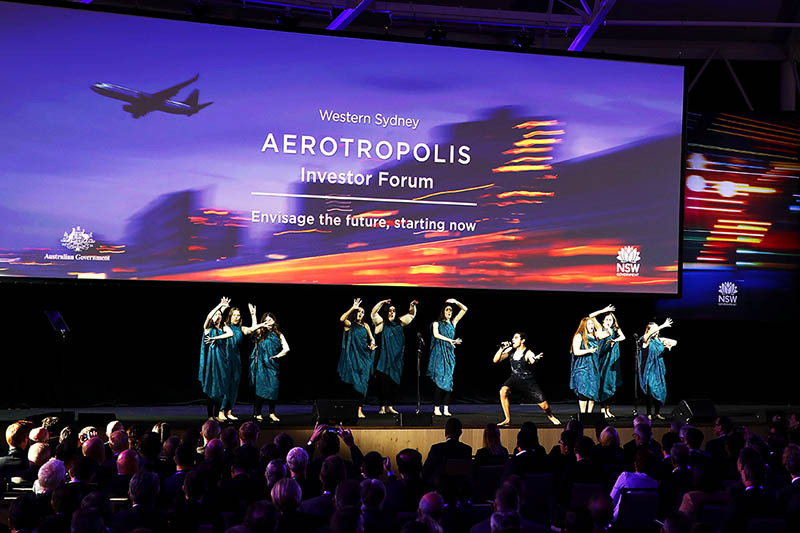 John Kasarda, in his 2015 aerotropolis feasibility study for the Sydney Business Chamber, stressed that “aerotropolis success rests as much on fast and efficient local and regional surface connectivity as it does on speedy national and global air connectivity. The fundamental metric for aerotropolis planning is not space and distance but time and cost.” In other words, to make it work, you’ve got to be able to move people quickly from A to B. The way things stand now, even with the state government playing massive catch-up with rail (Sydney Metro) and road (WestConnex) construction, the estimated travel time between the new airport and Sydney’s CBD is approximately an hour by car or train — regular commuter train, that is, not high-speed rail. And there’s no direct link between the two airports. On 4 December, the NSW state government announced that it would deliver a fast rail regional network in its next term of government — should it be given one — but no mention was made of the Western Sydney Airport. Let’s put scepticism aside for the moment, and look at what the planners imagine when they talk of “a global city, enriched by its heritage and connected to the world.” The Western Parkland City is forecast to be about the same size as Adelaide, with a population of 1.5 million, by 2056. It will have new schools and vocational training facilities and a university campus. It will have “city-shaping” transport (as opposed to roads and rail lines that all lead to Sydney’s CBD); and the rejuvenated South Creek catchment — the “green spine” — will be the city’s playground. The city will be “an epicentre for liveability,” they say. To back up this ambitious goal, there’s a pot of $150 million for local councils to do their own environmental and town centre upgrades, the so-called Liveability Program, drawing $60 million each from the federal and state governments and a minimum of $30 million from City Deal councils. In January, when the state’s Western Sydney minister Stuart Ayres announced the successful projects in the first round of “liveability” funding, he rhapsodised about the deal’s support for the region’s growth, and its “ability to attract national and international investment.” Ayres is the state member for Penrith, whose council picked up $24 million for upgrades to Regatta Park on the banks of the Nepean River. The aerotropolis, which at its fullest extension is forecast to cover 11,200 hectares around the airport, is a last-minute entrant to the saga of the second airport, but it turns out that now the airport decision has been made, it is the aerotropolis that is the hope of the side. The old justifications for Sydney needing a second airport at Badgerys Creek — rehearsed endlessly over sixty years, with much debate over how best to get passengers quickly from the airport to other destinations — seem to have receded into the background. The airport development seems not so much to be solving an airspace and city congestion problem as providing a miracle fix for the problems of Western Sydney. Across the planning spectrum, the number of jobs the aerotropolis will contribute — or “supercharge” — for Western Sydney within twenty years is given as 200,000. That number is writ large on billboards around Western Sydney promoting the airport and the aerotropolis. It’s a big promise to keep. Watson says the numbers are vastly inflated — “ludicrous,” he says. In Jobs for the West, a report published in August by the community organisation Jobs for Western Sydney Working Group, he dismantles the job projections for the airport in meticulous detail. The planners predict 28,000 jobs for airport operations by 2031 (a figure also written on billboards across Western Sydney). Watson examines the operations of airports of a similar size, including Adelaide’s, and comes to the vastly lower estimate of about 920 airport jobs for Western Sydneysiders by 2031. The case being made by governments for the airport and aerotropolis is classic “jobs blackmail,” he says. You accept our twenty-four-hour airport, and we give you jobs. On both environmental and economic grounds, this is not a future that is in the interests of the residents of Western Sydney. High-speed rail, he says, would generate many more jobs for Western Sydney. But isn’t it a done deal? “The earthworks have begun, but until the tarmac is laid for the first runway, all bets are still off,” he says. He is dismissive of what’s been put on the table by the City Deal and the three-cities planners: “Converting green colours on a map to pink where that equals urban development… doesn’t convert to jobs.” He summarises for me four major building blocks for the creation of jobs in Western Sydney: proper planning controls; twenty-first-century infrastructure; major enduring investment in education; and a commitment by government to co-invest with the private sector (he mentions the example of Silicon Valley). He’s asked the GSC for more detail about how exactly the aerotropolis will drive jobs creation, but thus far it hasn’t been forthcoming. The western suburbs, or what O’Neill calls “Australia’s great urban experiment,” have been growing much faster than jobs, transport and social infrastructure since the middle of last century. They were, and still are, a site for a very basic hope, the hope of a better life in a better place. Back in the 1960s, the suburb of Birrong, twenty-two kilometres southwest of Sydney’s CBD, was full of such hope. My husband Alex had a schoolfriend called Hans, a migrant kid like him, whose parents had shifted there from Glebe. They left a cramped and crumbling rental in the inner west for a brand-new house with a yard. Hans’s father was a machine operator and his mother, whom Alex remembers as a very clever woman, got work in a factory. There was work everywhere then — at the Chullora rail yards, the biscuit factories, the car factories, the fridge factories, the you-name-it-we-make-it factories. The state government was so optimistic about Birrong’s future then that it built not one but two high schools and an Olympic-sized public swimming pool, and this was before all the roads were sealed. I hadn’t heard of Birrong before I met Alex. That was in the early 2000s and he had been “out there” (my geography of Western Sydney was very hazy at the time) running a pharmacy since the late 1970s. His commute was forty minutes both ways, but he didn’t seem to mind. He listened to ABC radio in the car. His working day was long, and unpredictable. Bad things sometimes happened at the pharmacy, which had a post office sub-branch. Armed robberies were worryingly frequent. The shine had long worn off Birrong’s new-suburb promise. A lot of manufacturing jobs had moved further west or disappeared altogether, and it belonged to a middle ring of western suburbs between Bankstown and Auburn that were often in the headlines, for all the wrong reasons, mostly involving angry, violent young men and/or drugs. Alex is not a man prone to exaggeration. He learned early in life how to defend his corner and expects to have to do so. But when he’d describe his working day, I often felt as if I were listening to a foreign correspondent. He moved between worlds. It wasn’t just a spatial disconnect — the term planners often use to describe the experience of Western Sydney residents with long commutes — it was a cultural disconnect too. That sounds elitist, but most of those Alex rubbed shoulders with at work didn’t want to trade places with him. They weren’t passing through Birrong on their way to somewhere better. They had friends and family in the community, and they had rich lives. That’s what we who live closer to the city so often fail to see because our minds are cluttered with images of Western Sydney as a place of disadvantage. Western Sydney has always been driven by surges of overseas migration and land release, and both are at full throttle now. Blacktown, for instance, thirty-four kilometres west of Sydney’s CBD, added almost 20,000 overseas migrants to its population of around 350,000 between 2011 and 2016, according to demography experts at .id, which has partnered with Phillip O’Neill at Western Sydney University. Between this year and 2036 Blacktown’s population is forecast to increase by more than a third. The people are coming from everywhere, but a sizeable proportion is from India and China. “These people are young, skilled, fertile,” according to .id founder Ivan Motley. The group growing most quickly in Blacktown in the next ten years will be in the ten-to-fourteen age bracket. A lot of Western Sydney residents, however, are shut out of the housing market. Suburbs like Granville, which has had a pretty seedy reputation in its time, are now up and coming. Western Sydney has seen a sharp increase in both rental stress (the electorate of McMahon, which includes Blacktown, is the third-worst in Australia on this measure) and homelessness. The Western Sydney Community Forum’s Build Beyond Bricks initiative estimates that nearly 40 per cent of homeless people in New South Wales live in Western Sydney. Well over half the state’s 14,000 homeless people are aged between twelve and twenty-four. The causes of homelessness are complex, but for young people, low rates of school completion and a halving in the number of full-time jobs for fifteen- to nineteen-year-olds since 2008 are among them. Job shedding in Western Sydney began in the mid 1970s when Australian manufacturing started restructuring. It hasn’t stopped. Between 2006 and 2016, 15,000 manufacturing jobs were lost from Western Sydney. Manufacturing is still crucial to the region, but most of the new jobs in the “new economy” have bypassed Western Sydney, says Watson. Of the 60,000 new jobs in professional, scientific and technical services created in that decade, fewer than 10,000 went into Western Sydney. More and more people who live in Western Sydney have a bachelor or higher degree. But there aren’t enough jobs there for the well educated (nor for the poorly educated, but that’s a whole other matter — “the education story in the southwest is not a good one,” as O’Neill says). In Blacktown, for instance, residents working in retail, in blue-collar jobs and in professional health and education jobs tend to work locally, but Watson says that half of all computer programmers, for instance, or around 1000 people, commute to inner Sydney to work. O’Neill estimates that if things go on as they are, there will be 210,000 fewer jobs in Western Sydney than there are resident workers by 2036. Related to this jobs deficit is the number of people who leave Western Sydney every day to go to work in other parts of the city, Blacktown’s computer programmers among them. Depending on your source, it’s between 150,000 and 300,000 people each day, and what’s usually said in the same breath is that nearly three-quarters of them take their car. The Grattan Institute’s Marion Terrill sees it differently. In October she produced a report that poured cold water on the popular image of low-income commuters from the outer suburbs of Australia’s biggest cities forced to travel ever-greater distances to work, clogging up transport arteries. Fewer than 20 per cent of working-age people in Sydney have a job in the CBD, she says, and only 10 per cent work in suburban employment hubs, the importance of which is frequently overblown by government planners. Her research finds that three-quarters of all jobs in Sydney, as in other big Australian cities she analysed, are dispersed all over the city. In fact, the average commute distance barely increased in the five years before the 2016 census, and there’s been little or no change in how long people spend travelling to and from work. People are not hapless victims of population growth, dependent for their wellbeing on governments building the next freeway or rail extension, Terrill says. They adapt and choose where they live and how they get to work based as much on their values as on any other factor. Rob Roggema, who remains closely connected to Western Sydney via a six-country project investigating the relationship between agribusiness and ordinary neighbourhoods, questions why on earth you’d be building a new city on those dusty plains. Take Penrith, for example. Fifty kilometres west of Sydney’s CBD, a long way from sea breezes, it suffers from sweltering summer temperatures. On 8 January last year it was widely reported that Penrith had been the hottest place on earth in the previous twenty-four hours, with the temperature reaching 47.3°C. Average mean maximum temperatures have increased by 1.1°C in Penrith since 1980, and with ANU climate scientists predicting that Sydney and Melbourne will experience temperatures as high as 50°C during summer heatwaves after less than 2°C of global warming, it can only get worse. “What are we doing putting people in a place where it’s over fifty degrees in the summer?” asks Roggema. “And if we do, we need to make it a cooling environment rather than heating it.” He’s referring to the urban heat island effect that comes into play in densely built, sparsely shaded urban environments. In April, the NSW government pledged to plant five million more trees across Sydney by 2030, its own research having shown that morning summer surface temperatures in treeless areas are 12.8°C higher than in vegetated urban areas. WSROC (a regional collaboration of Western Sydney councils) has just introduced a Turn Down the Heat strategy in anticipation of temperatures reaching crisis point within five years — which is not long enough for trees to grow to maturity. While mature trees will provide shade and survive in 50°C, says Roggema, not many trees will grow to maturity at that temperature. It’s very early days for passing judgement on all of this, of course. The authority in charge of driving local and international investment, the Western City and Aerotropolis Authority, wasn’t set up until November, with NSW Health Infrastructure chief Sam Sangster as its inaugural boss. That same month, the new authority’s interim chair, Geoff Roberts, who is also a GSC commissioner, was in London looking for early-bird tenants for the aerotropolis “core” among British defence and aerospace, agribusiness and advanced manufacturing companies. By the end of 2018 firm interest in tenancies had come from American defence contractor Northrop Grumman, Australian pharma manufacturer Vitex, Sydney Markets, and a university consortium (including UNSW, Western Sydney University, and the universities of Newcastle and of Wollongong) that intends to build a STEM campus at the aerotropolis. Two Japanese multinationals, Mitsubishi Heavy Industry and Sumitomo Mitsui Financial Group, created major excitement when they signed memoranda of understanding in October. Of the aerotropolis’s nine precincts, two commercial precincts — the core and the so-called Northern Gateway — have been selected by the state planning department for rezoning by the end of 2019. The first stage of the aerotropolis land-use plan also earmarked the “green spine” — the South Creek catchment area — for early development. The core is sited on a 114-hectare parcel of land at North Bringelly that belongs to the Commonwealth, which makes it pretty straightforward. The ownership of the 344-hectare Northern Gate, described as “one of the largest single-owner land holdings” in the aerotropolis, is less clear. It once belonged to Roy and Ron Medich, who bought it from the CSIRO in 1996. 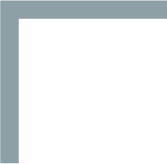 But the Sydney Morning Herald’s Kate McClymont reported in August 2017 that the Mediches had sold it secretly to Chinese investors linked to Boyuan Holdings Ltd, which listed on the ASX in 2016. Roy Medich wouldn’t confirm the sale, rumoured to be worth $500 million, saying details were confidential; not long after, Ron was sentenced to thirty-nine years in prison for murdering his former business partner Michael McGurk. It is indeed Boyuan Holdings that is proposing to develop the Northern Gateway site, along with its consortium partners Western Sydney University, logistics firm Logos, Scentre Group (which owns and operates Westfield in Australia and New Zealand), and the neurosurgeon Charlie Teo. According to an October 2018 report in the Urban Planner, Boyuan claimed the development would generate more than 55,700 jobs, an astonishing 28 per cent of the Western Sydney City Deal’s target of 200,000 jobs. Another property group, Celestino, this one with a background in poultry farming, has already started building a Science Park on 280 hectares it owns at the Luddenham end of the aerotropolis zone. It values the project at $5 billion, and expects it to deliver 12,000 smart jobs, educate 10,000 students and provide more than 3000 homes. Nearby Liverpool — an airport “edge” city, in the new lingo — is set to arrive too. It’s already sprouting high-rise apartment blocks, though it’s still a big country town, full of modest bungalows, and the new buildings don’t yet look at ease on the plains. I know of a former Qantas IT exec, now a contractor, who travels there from his home in Waverley in Sydney’s eastern suburbs each day, a three-hour round trip, to work on the Badgerys Creek project. David Borger, a former mayor of Parramatta and one-time NSW government minister who now straddles political and corporate worlds as the Western Sydney director of the Sydney Business Chamber, has a completely different take. Sure, some of the planners’ ideas mightn’t get up — he is more convinced by the prospects for agribusiness, tourism and logistics in the aerotropolis than by the hopes for some other industries for which great expectations are frequently expressed. Sure, Western Sydney is “bloody hot” and that has to be dealt with head-on. His own view is that temperature-reduction targets should be built into development. If people don’t meet the target, they don’t get the funding. Books | What makes political leaders take their country to war?